You may already be familiar with the Micron® but did you also know there are 6 other varieties of Pigma pens, all with the same high quality archival ink? Read below to learn more or visit our main site for detailed information about sets and performance. Available in 8 nib sizes and assorted colors. Assorted ink colors vary between nib sizes. Sakura has enhanced the Pigma Micron experience with a new pen for everyday writing! Loyal users of Pigma Micron requested a choice of nib suitable for every day, multi-purpose writing with the same quality Pigma ink performance. 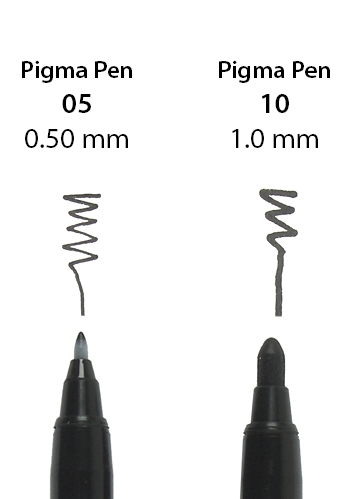 Introducing Pigma Micron PN - the durable Plastic Nib (PN) provides skip-free writing in eight popular Pigma ink colors. A fine or medium line width (0.4mm to 0.5mm) can be achieved, based on your personal writing pressure. The polyacetal nib structure allows for smooth ink-flow whether writing fast or slow, for right or left handed users, and for writing at an angle. Ideal for use on paper.Sakura has enhanced the Pigma® Micron® experience with a new pen for everyday writing! Designed to meet the specific needs of illustrators, cartoonists, and manga artists, the variety of drawing nibs broaden the available illustration techniques that can be used. Fine lines, shading, textures, and coloring in images can easily be mastered by the hobbyist. Available in bullet and chisel nibs. Assorted ink colors vary between sizes. Writes like a pen and paints a like brush – two methods in one elegant tool. Pigma Brush is comfortable to hold and responds to instant changes in pressure or direction. Vivid, fresh color enhances hand made compositions and conveys personality, style or feelings. Forget the refillable cartridges, ink wells, and removable pen nibs. This disposable pen has a hard nylon nib that withstands heavy pressure and constant use, and still provides a reliable, smooth ink flow from edge to edge. If you are accustomed to other disposal “fiber” calligraphy nibs – it may take some practice getting use to our flat, firm, nylon calligraphy nib. Pigma Calligrapher’s nib performs more like a professional “flat metal nib”. Pigma Calligrapher is a great choice for both amateurs and professionals. It eliminates cost barriers and equipment requirements for beginners who are just learning about calligraphy, and provides an easy and quick alternative to traditional calligraphy pens for professionals. Available in 3 sizes and 6 colors. Learn to draw like the pros using the same rich, black Pigma® ink that's been the trusted ink of Manga professionals for over 25 years. Pigma Sensei provide the tools you need to illustrate in the Manga or comic style. Rich Pigma ink comes in a variety of durable nib sizes for inking and adding dimension. 3 chisel nibs are perfect for inking pens for sharp lines and filling in large spaces. Use fine lines for facial expressions, lettering, and detailing, or bold lines to add impact and drama. Available in 7 nibs. Black ink only. Pigma has become the standard for what is defined as permanent ink, relied upon by those whose jobs depend on records that stand the test of time. Enjoy high quality Pigma inks in a more economical barrel and sturdy nylon and fiber nibs. The Pigma pen is ideal for those who need high quality, archival ink paired with sturdy nibs. Budding comic/manga artists will appreciate the more durable nibs while learning to master ideal pen pressure. Available in 2 sizes: 05 - sturdy nylon fine point nib, 10 - fiber bold point nib. Black ink only. From super fine hairlines to big, bold strokes, the new Pigma Professional Brush series offers the ultimate in versatility. These durable brush nibs respond to instant changes in pressure or direction with a silky smooth, accurate and consistent ink flow. The deep black, archival quality Pigma ink ensures the mark will last a lifetime. Available in 3 sizes: FB, MB, and BB. Black ink only.